Citrus College couldn't contain the Vikings, and especially not freshman Lauren Ingram, who scored a pair of goals in LBCC's 2-0 win. 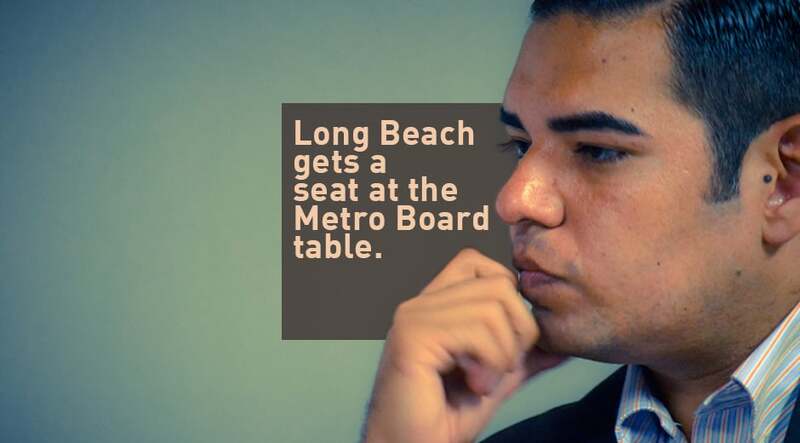 The election of Long Beach Mayor Robert Garcia to the Los Angeles Metro Board is huge news—and not just for urbanerds and transit geeks; this is big news for Long Beach and the region. Officially elected to the post tonight by the the Mayors and Councilmembers of the County, replacing Lakewood Councilmember Diane DuBois, Garcia will oversee the Gateway Cities Region, a 26-city span of the east side of the County. It reaches La Habra Heights on its most eastern edge, Pico Rivera to the north, Compton on the west, and Long Beach on its south side. It’s bigger than the fact that it’s just Long Beach being represented. Bonnie Lowenthal, the last Long Beacher to serve on the Board nearly a decade ago, had shining moments such as leading the charge against raising the age for a senior discount—but under her tenure, concerns regarding the Blue Line’s infrastructure, safety, and increasing multi-modal transit were left somewhat ignored. And not necessarily because Lowenthal lacked the chops but mostly because the Board was and still is non-New Urbanist. Garcia joins Los Angeles Mayor Eric Garcetti and Councilmember Mike Bonin—with, perhaps to some degree, the work of Supervisor Sheila Kuehl and Inglewood Mayor James Butts—as the leading members bringing in New Urbanist ideals to a board that has largely been led by older philosophies when it comes to transit. Take, for example, the woman he replaced: Dubois was an outspoken critic of Measure M, a ½ ¢ sales tax that continues upon the existing ½ ¢ traffic relief tax until voters decide to end it, claiming it gave steam to massive projects like the Sepulveda Pass while ignoring the South Bay and Gateway Cities regions. The measure passed resoundingly: nearly 7 out of 10 voters supported the measure—and Garcia has priorities when it comes to Measure M and its implementation in our region. Those “great package” details in terms of relating to Long Beach? The incredible local returns Measure M offers. This reflects what Garcia hopes to achieve on a grander, more intellectual level: shift the philosophy of Metro’s doings toward multi-modal transportation deviates away from the individual car. When referring to multimodal access to public transit, Garcia means more than just building more bike lanes, extending more rail lines, and widening sidewalks. It means creating more harmonious, safer, and better designed public transportation stops, particularly and especially the eight stops on the Blue Line that are in Long Beach. It means creating biker feeder and multi-use paths that allow bicyclists and pedestrians with better connections to public transit. It means creative and scramble crosswalks and better pedestrian signals with sufficient crossing times. It means increasing the capacity for bicyclists to bring their bikes on trains and buses while also providing them with parking and storage facilities at centers and stops. It means increasing bike share programs for those that don’t have a bike. And it ultimately comes down to a more progressive approach that embraces new urbanism ideals while fighting back against the dominant of the single-user vehicle. Of course, this battle—having become more prevalent in Los Angeles over the past decade as both citizens and municipalities across urban centers grapple at dealing with how to efficiently move people around—is not an easy fight to fight. Even those willing to give up their bumper-to-bumper battle on the freeways in favor of a hands-free ride on the Blue Line continually voice a concern with two things: timing and safety—and therefore a concern with comfort and likelihood to use the rail arises simultaneously. For many Blue Liners taking the trek through Long Beach, frustration arises with its lack of traffic light synchronization–a long-discussed, long-dreamed-of addition to the Long Beach stretch of the rail but one that hasn’t reached fruition. On a bad day, should the train hit every light, you can see an extra 15 to 20 minutes added to your trip. Garcia joins Los Angeles Mayor Eric Garcetti and Councilmember Mike Bonin as the leading members bringing in New Urbanist ideals to a board that has largely been led by older philosophies when it comes to transit. “It’s unacceptable that the Blue Line has no signal preemption system—and it’s something I’m intent on addressing,” Garcia said. While the lack of traffic light synchronization might be deterring some riders, there is no question that the other part of lower ridership—safety—plays a much more prominent role. Garcia isn’t just presuming the perception of a lack of safety: a Metro survey found that 29% of those who stopped using Metro did so because they felt unsafe. In this vein, Garcia loudly reiterates his support of altering the policing contract Metro holds with the LA County Sheriff’s Department (LASD). As of now, the LASD patrols the entire system while a new proposal will make policing the rail system a multi-agency effort, with LAPD and LBPD joining LASD at key points. “I spoke out in favor of LBPD policing all eight of the stops in Long Beach that are along the Blue Line—and I still believe it’s the right thing,” Garcia said. The Metro contract with LASD officially expired on December 31 of last year but the Board voted to delay approving the new $546.5M multi-agency contract that would run over the next five years with the work split between the LASD ($129.8M to $149.8M), LAPD ($369.7M) and the LBPD ($27M). would result in more officers riding buses and trains instead of the current situation which, according to Metro’s security chief Alex Wiggins, often results in uncertain staffing on a day-to-day basis and shaky coverage during shift changes and late nights. Metro staff also say the new arrangement would result in much better response times than the current 16 minutes under the LASD for all calls over Metro’s 1,400 square mile service area. One reason: the bulk of the calls made asking for police by riders come in the city of Los Angeles. The LAPD says its response time is six minutes for calls and the LBPD says it has a five minute response time. The chiefs of all three agencies made hard pitches to the Board. The LASD’s Jim McDonnell said the best way to keep riders safe was to retain the LASD as the one agency in charge of policing the system — and credited the LASD for the reduction in crime on Metro thus far this year. The LAPD’s Charlie Beck said that his force has the largest anti-terrorism unit outside of New York City and that the overtime they would use to patrol Metro is a tactic commonly used in L.A. LBPD Chief Robert Luna emphasized the low response times in Long Beach and the importance of keeping the Blue Line safe; Long Beach Mayor Robert Garcia added that the city receives very frequent complaints from residents about safety on the Blue Line. The Board is faced to vote on the contract yet again come February. Onward and upward, Long Beach.